Stay Current with The Business of Medicine, Our FREE Newsletter. 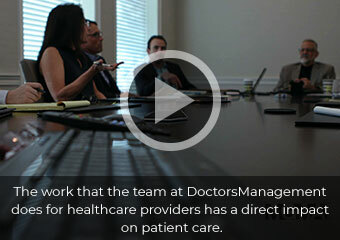 DoctorsManagement delivers the best return on investment of all our vendors. The DM team has helped our practice to achieve business goals and manage risk far beyond our expectations. They keep us reaching for the next level of success, which helps our practice maintain a competitive edge and a standard of excellence. I talk about the services DoctorsManagement provides at every appropriate opportunity. My positive comments are not only about the many programs and services, but also the friendly yet extremely professional staff and representatives. With DoctorsManagement's Power Buying Program, our hospital was able to achieve savings on our clinical, office, and food supplies. In addition, we realized over $120,000 in savings on the purchase of a CT machine.